Thanks to Ryan Rawlins for donating this idea. 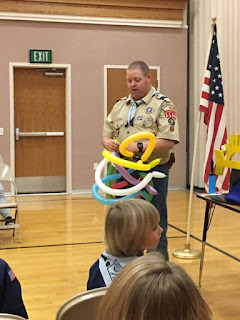 He is the Cubmaster of Pack 1144 in the Porter Rockwell District, Utah National Parks Council. Props Needed: 8 Balloons to represent the 7 virtues of the AOL. Twisty Balloons in colors and black for headband. 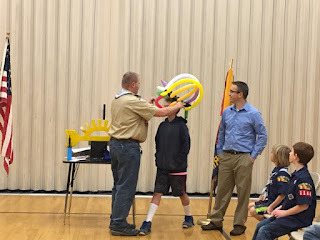 Tonight we gather to honor _____ (# of Scouts receiving award) Webelos Scouts that have earned the highest award in Cub Scouting: The Arrow of Light. These Scouts have worked very hard over the last year to earn this prestigious award, and demonstrate that they understand the purpose of Scouting. The seven rays on the display before you represent the rays in the Arrow of Light. 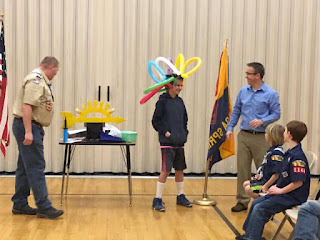 These seven rays stand for the seven great virtues of life, virtues that a Webelos Scout must have if they are to succeed and advance in Scouting and in life. For younger Scouts, living by and using these 7 great virtues will help you achieve much on your trail upward to the Arrow of Light. 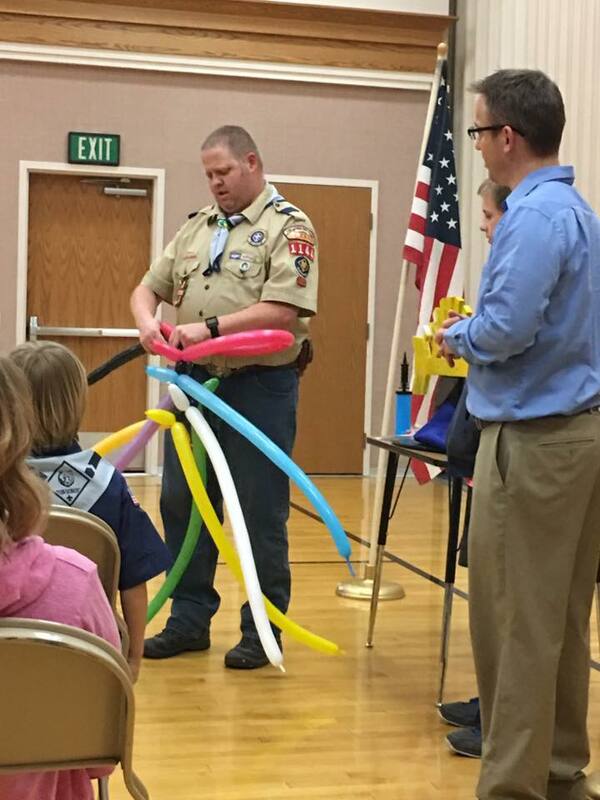 For each virtue inflate the balloon to near full and hand it to the Scout to hold. A Scout has WISDOM (Purple) Having wisdom doesn't mean that a Scout is smarter than others. It means that he uses what he knows to live a better life -- to be a good example for other people, young and old, Scouts and others, family and friends. A Scout has COURAGE (Red) Having courage doesn't mean that you're never afraid -- very courageous people are often afraid. However, facing danger despite your fear is the act of a brave, courageous Scout. 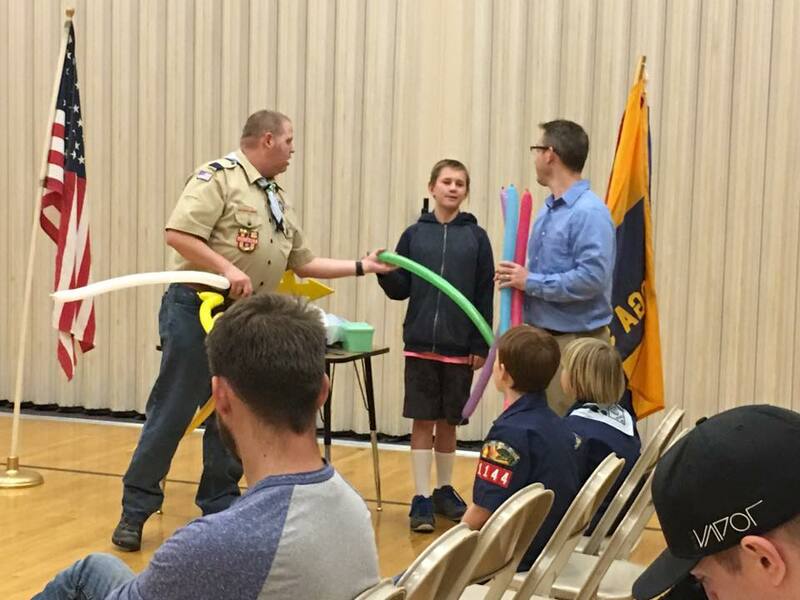 A Scout has SELF-CONTROL (Orange) Scouts have to know when to stop. When you can stop yourself when you have had enough or done enough of something -- enough eating, enough playing, or even enough working -- then you have self-control. Know what behavior is correct in each situation, and do it. When you have self-control, you are growing up as a Scout. A Scout gives JUSTICE (Blue) Justice is part of the Pledge of Allegiance: "with liberty and justice for all"/ Justice is being fair with others that we go to school with, work and play with. Justice means it doesn't matter who the person is, or what color they are, or what they do...Scouts are fair to everyone. A Scout has FAITH (Yellow) Scouts believe in God. Faith means that we believe in God and other things we cannot see. When you know God exists in your heart, you have faith. A Scout has HOPE (Green) Hope means you look forward to good things that you believe will happen. You hope for better things tomorrow, but you work hard today to make those good things happen. A Scout has LOVE (White) Scouts have many kinds of love. Love of family, home, your fellow Scouts, God and country are all a part of Scouting. Every kind of love is important for a full and happy life. 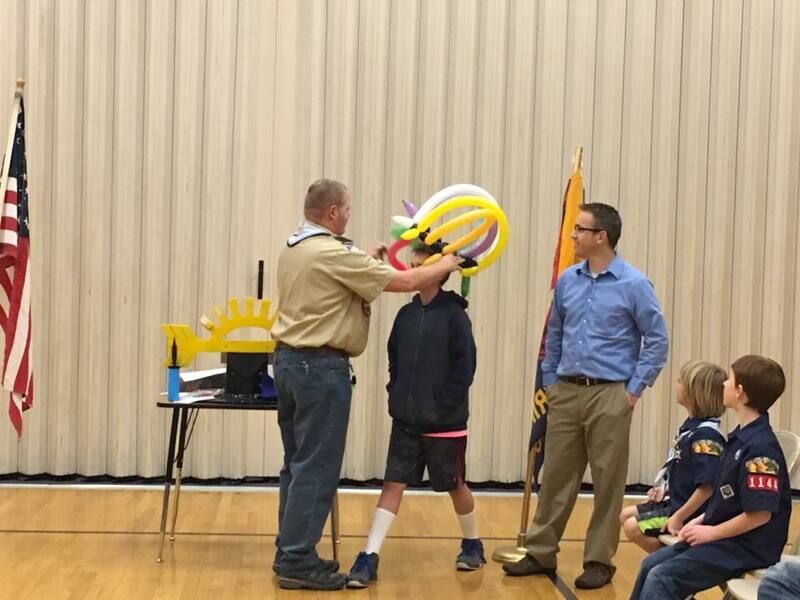 Now is the time to have the scout talk about some favorite things he did to earn the Arrow of Light. Inflate the balloon for the headband about ¾ full. Twist each of the colored balloons onto the headband. 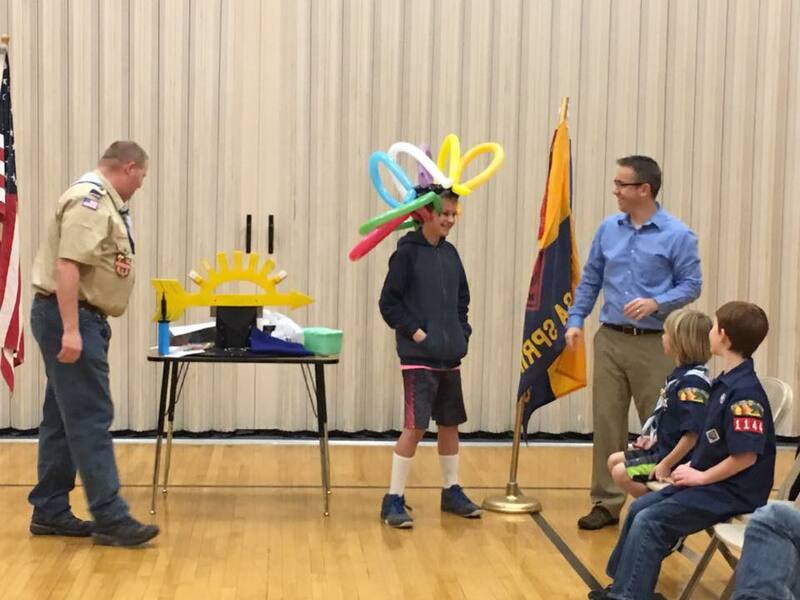 Once that’s done then size the headband balloon to the scout. You will find that if you live by these seven virtues, you will be happy and will make the people around you happy as well. The Webelos Scout(s) before us this evening have proven that they understand their responsibilities as good sons and good Scouts. With the help of their willing parents, they will advance far along the Boy Scout Trail. Congratulations, Scouts.